NEW YORK (CNNMoney) -- Home prices hit another new low in the first quarter, down 5.1% from a year ago to levels not reached since 2002. It was the third straight quarterly drop for the S&P/Case-Shiller national home price index, which was released Tuesday. Prices are now down 32.7% from their peak set five years ago. "Home prices continue on their downward spiral with no relief in sight," said David Blitzer, spokesman for Standard and Poor's. The index covers 80% of the housing market, and this month's report confirmed "a double-dip in home prices across much of the nation," said Blitzer. 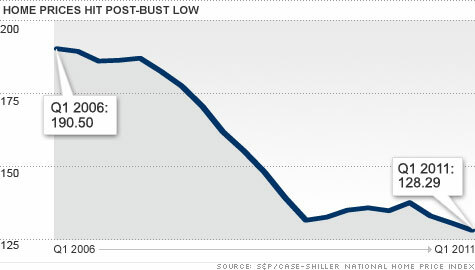 The housing market went through a brief recovery period starting in mid-2009, recovering nearly 5% of earlier losses. After homebuyer tax credits expired last April, the slump resumed. Of the 20 cities, only Washington has posted a home-price gain: 4.3% over the past 12 months. Minneapolis homes lost the most value over that period, with prices falling 10%. Prices continue to be hammered by foreclosures with high numbers of repossessed homes flooding the market. Many repossessed properties are in poor condition and sell at a big discount to conventionally sold homes, driving down overall values. Falling home prices have a devastating impact on new home construction, according to Pat Newport, a housing market analyst for IHS Global Insight. "They are a key reason why builders aren't building new homes, even in the fastest growing states, like Texas," he said. "Existing homes are selling for so much less, the builders can't compete." Normally, new-home construction is an important contributor to the economic recovery. Not so this time, according to Mike Larson, an analyst with Weiss Research. "Housing has been an albatross for the economy as opposed to an engine powering it," he said. If residential development had come back as it has in the past, the current recovery would be much stronger. There's be much more robust hiring of construction workers, building materials manufacturers and drivers and deliverymen to bring the products to site. Newport pointed out that when developers build a new home for $300,000 it adds $300,000 to the economy, as measured by GDP. An existing-home sale just adds 5% or 6% in broker's commission. "As a component of the GDP," said Larson, "housing has been out to lunch."